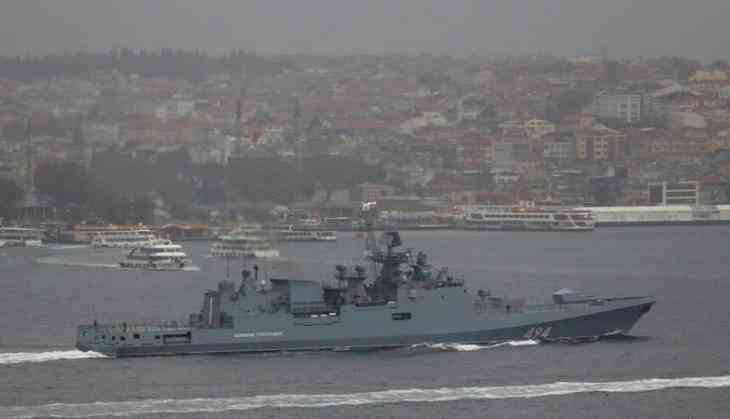 Two Russian Navy frigates and a submarine has fired six Kalibr cruise missiles on Islamic State targets in Syria. Huge ISIS ammunition depot near the town of Aqerbat was destroyed by a precision strike. "From the eastern part of the Mediterranean, the frigates 'Admiral Essen,' 'Admiral Grigorovich' and the submarine 'Krasnodar' of the Russian Navy fired six cruise missiles 'Caliber' on the ISIS targets in Syria. Submarine "Krasnodar" carried out launches of cruise missiles from an underwater position; Russia Today quoted the Defence Ministry statement. The strikes targeted Islamic State (IS, formerly ISIS/ISIL) command and control centres, as well as ammunition depots in the Syrian province of Hama and the Defense Ministry stated that the militants who survived the attack were later killed in airstrikes. According to the Russian MOD, the terrorists were attempting to leave Raqqa which is besieged by Kurdish militia of the Syrian Democratic Forces (SDF) and the U.S.-led coalition forces and head towards Palmyra using a "southern corridor." Russia launched its military intervention in Syria in September 2015 after an official request by the Syrian government for military help against rebel and jihadist groups.